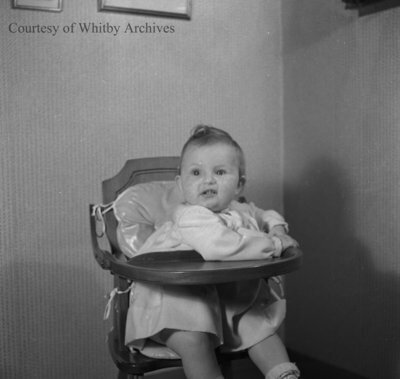 A black and white medium format negative of Susan Davey taken on March 20, 1945. In this view she is sitting in a highchair with her hands on the tray. She is looking to the left of the photographer. Susan Davey, March 20, 1945, Marjorie Ruddy. Whitby Archives A2013_040_555.